FILE - A photo provided by U.S. Immigration and Customs Enforcement shows mothers and their children standing in line at South Texas Family Residential Center in Dilley, Texas, Aug. 9, 2018. The head of CBP, Commissioner Kevin McAleenan, repeated at a news conference Wednesday in El Paso that the "surge numbers are just overwhelming the [U.S.] system." While the U.S. has handled more border apprehensions than the current level, what has shifted in recent months is the demographics. More parents are traveling with young children, and with that change comes a different set of challenges, especially regarding detention facilities. CBP detained 76,103 people in February. Nearly half — 36,174 — were part of family units. 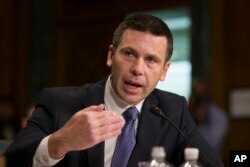 McAleenan blamed congressional inaction on immigration for the surge. However, motivators behind migrant flows are considered multifaceted. FILE - U.S. Customs and Border Protection Commissioner Kevin McAleenan speaks during a hearing of the Senate Judiciary Committee in Washington, March 6, 2019. McAleenan said that additional CBP staff — about 750 people he called "humanitarian personnel" — would be temporarily assigned to help process detainees on the southern border. The agency plans to move those employees from border checkpoints to handle arrivals that happen away from the formal entry points. The diversion of personnel could slow down access through checkpoints as the Easter holiday approaches — a busy week for residents on both sides of the border to cross for family visits, a long weekend, or shopping. "We're doing everything we can to simply avoid a tragedy," the commissioner told reporters. The deaths of two children in CBP custody at the end of 2018 prompted increased scrutiny of how the agency handles detainees' medical issues. The border news conference comes as Homeland Security Secretary Kirstjen Nielsen traveled to Miami to discuss the migrant issue with Mexican officials, before heading to Honduras to meet with representatives of the Northern Triangle. Nielsen is slated to sign a regional agreement with Guatemala, Honduras and El Salvador addressing migration flows from Central America to the United States. The so-called "regional compact" would address "information sharing, law enforcement cooperation, and public messaging," according to DHS.